Kids are the best evangelists! Kids should own their faith. Peer influence is real and powerful. When kids see other kids owning and expressing their faith, it helps them grow in grace. It encourages them and gives them confidence when they see that they are not too young for their faith to make a difference in their own lives and the world around them. KidsTalkAboutGod.org offers children a Christ-centered worldview that is contagious! Kids should express their faith. Both the Kids Color Me Bible and the Kids Color Me Bible Gospel of John invite your children to answer questions and draw Christian art related to Bible stories. Each chapter in these free, online books is downloadable/printable and includes a Bible coloring page. 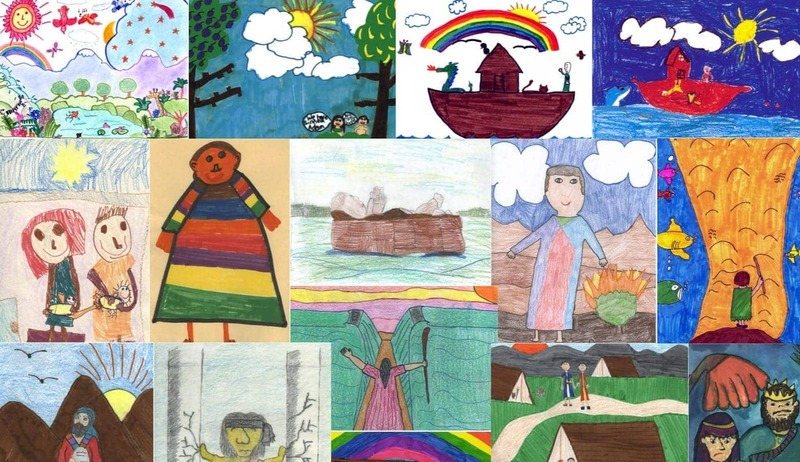 Through their artwork and/or writing, 28 kids have won week-long vacations for their families at dude ranches in Colorado, Wyoming, Idaho, Montana and other states. An 11-year-old girl won a trip around the world to visit and report on activities of missionaries for a documentary that has been shown in thousands of churches. A 12-year-old boy won a trip to Kenya, where he saw lions, elephants, giraffes, hippos and other African animals during a real African safari. Watch the Mission Explorers Video Series and the new trailer for Mission Explorers Kenya. Don’t miss out on the next opportunity. Sign up for Kids Talk About God news at www.KidsTalkAboutGod.org/news. Missionary Inspired Great Commission Reported by Kids. The Great Commission is shown in action by kids who experience the mission field in Africa, India, Philippines, Fiji Islands and Bolivia. Our latest mission adventure took 12-year-old Jesse Patete to Kenya for more than five weeks. He interviewed missionaries and went on a real African safari for the new documentary Mission Explorers Kenya. Please see the two-minute trailer at www.KidsTalkAboutGod.org/trailer. The original Mission Explorers series features 11-year-old Hillary Welborn in a mission trip around the world. Mission Explorers Africa: The Musical is based on the Africa segment of this global mission trip. The sound track was arranged and recorded in Kenya by African musicians. If we do a nationwide audition for the next Mission Explorers documentary, you don’t want to miss this unique opportunity. Sign up for KTAG news at www.KidsTalkAboutGod.org/news. Free Family Devotionals To Bring Your Family Closer to the Lord. Kids Talk About God columns feature kids’ answers and Bible answers to some of life’s biggest questions. These short newspaper columns are perfect for family devotionals or Bible lessons. Let us email you three columns per week at no charge. Sign up at www.kidstalkaboutgod.org/family. Bible Lesson Archive To Make You Bible Smart. Even if you don’t know the Bible, you can become a whiz with our Bible lesson archive. With one click, you can access a Bible archive of Kids Talk About God newspaper columns. In addition to using these columns for family devotions, you may also use them to supplement a Bible study, a sermon or even a speech to your local Rotary Club. Here is the link to the archive: www.kidstalkaboutgod.org/archive. God’s Word In Their Hearts. Scripture memory is an important way for people of all ages to have God’s Word in their hearts all the time. If children memorize key Bible verses, these powerful truths will stay with them, probably all their lives. Each column in the Bible Lesson Archive ends with a scripture verse to memorize. There are also printable Bible memory cards available here in two different Bible translations. Get them started early on this positive, faith-building habit! By Grace Through Faith & More Grace. We are saved from sin’s penalty by grace through faith alone in Christ alone. At the moment anyone believes in the Lord Jesus Christ as his or her savior, the Lord’s eternal life is imparted and can never be lost (John 10:28-29). Because of the all-sufficient sacrifice of Jesus for everyone, anyone may receive eternal life as a gift apart from any works (Ephesians 2:8-9). The grace that saves us from being separated from God forever is the same grace that saves us from sin’s power as we depend on the Lord’s resurrection life within us (Galatians 2:20). Born-again children who learn to live by God’s grace will experience a lifetime of being God’s heavenly ambassadors during their short journey through this life. KidsTalkAboutGod.org is committed to the gospel of grace and to living by grace.